Proceedings of the Eighth National Conference on Australian Forest History. Edited by Brett J. Stubbs, Jane Lennon, Alison Specht and John Taylor. 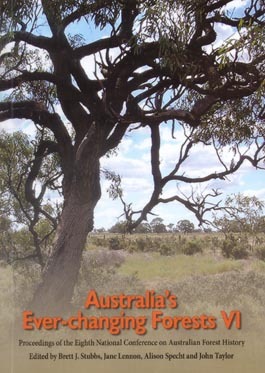 Published by the Australian Forest History Society Inc. in association with Tankard Books. Part of the Australia's Ever-changing Forests Series. The Australian Forest History Society, founded in 1988, has members in Australia, New Zealand, and other countries. It has held previous conferences in most Australian states and in New Zealand. The aim of the Society is to advance historical understanding of human interactions with Australian forest and woodland environments, but conferences typically include contributions on those environments in New Zealand, Asia, and the Pacific region. The Society does not provide a forum for advocacy of environmental or forest policy, but welcomes different perspectives. New members are welcome, but membership is not a condition for conference attendance.